If you are new to Pro Tools the different kind of track options available can sometimes be daunting, in fact sometimes even seasoned professionals are not entirely sure of the benefits of using different track types. 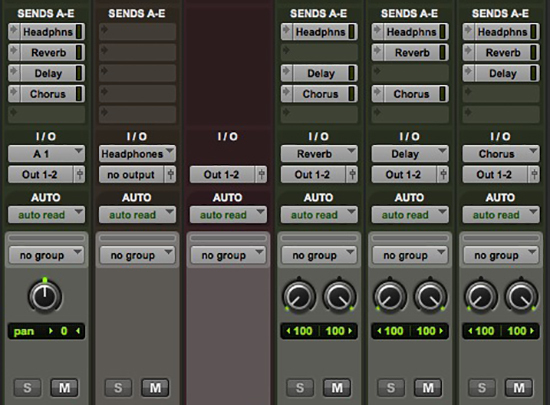 We recently took a look at Pro Tools instrument tracks. We will take a look at each type of Pro Tools track in detail, explaining each section to the Pro Tools track type and how to use them. In this post we are looking at the Pro Tools aux track. Aux tracks enable a user to route live audio through Pro Tools, in many ways they work just the same as a audio track but you cannot record any audio on these tracks. Sub mix a group of tracks during mixing, for example all drums could be routed to an aux track so that you have a stereo drum mix, often called a drum buss. Route hardware synths and drum machines that are being triggered via Pro Tools MIDI tracks, although you may find using an instrument track to be better for your purposes. Route hardware effects back into Pro Tools such as hardware reverbs, delays or compressors. Route hardware audio devices such as CD players or record decks or an external audio mixer. You can click on the image above to enlarge. Now I’m going to rename the channel ‘Guitar Buss’ and then route to it from the outputs of the guitar tracks. Then I find a spare set of busses to route into the Guitar Buss channel, in this case Bus 7-8 are free as a stereo pair, so I’ll select them. To do this click on the input option on the channel, go to the bus menu and scroll to the next available bus, those in use will be yellow as you can see below. The next thing to do is then to route the channels you want to go to the Pro Tools Aux track. If you are sub mixing then you do this via the track outputs. The next thing to do once the buss is set-up is to rename the buss routing, you can do this simply by right mouse-clicking on either the input or outputs and selecting the ‘rename’ option. Now our two guitar tracks to the left in the image above are being sent via an aux track which can control volume, pan and if you wish add further inserts across the whole group such as buss compression. You can use automation too on the entire buss. The above method allows a mixer to control huge mixes using sub-mixed aux channels, in effects hundreds of tracks can be running through half a dozen aux channels. I often have 50 track mixes running through less than 10 sub mix channels. 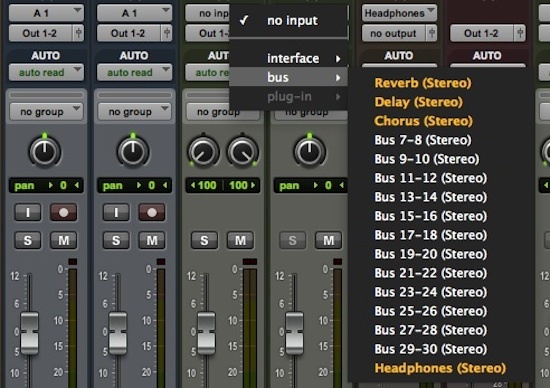 You can use the same method shown above to create a headphone buss and then send that out of Pro Tools, however instead of using the output channels of each track you use a send and route as shown in the previous example via a free bus channel and then use a spare audio output on your audio interface to send the audio out of Pro Tools. You can see this in the picture below. Send A has been sent to a spare stereo aux track, renamed as ‘Headphones’ and then the new Aux track is being sent to outputs 7-8 of my audio interface to the headphones. Then I can create a separate headphone mix for tracking. The same method can be used to create reverb or delay sends but in the case of these you simply leave the output channels going to your stereo outputs so that they can be heard. Finally Aux inputs can be used to route external hardware such as synths and rack gear into Pro Tools. To do this simply create a new Aux track and then select a free hardware input from your hardware interface. In the image below I’m going to use input 5-6 to bring my hardware back into Pro Tools. Remember you can’t record on an aux track so if you want to record the input from this channel at any point then you are going to have to either route it to a new audio track or create an audio track and route the inputs as described in the previous sentence.